I received a ping this morning from Chef Richard Ekkebus of Amber. Would I be interested in joining the Azurmendi/Aziamendi pop up tonight as his guest, he asked. To be perfectly honest, I had known about this pop up for a while, but hadn't planned on going. I was looking forward to a night off tonight, since I was scheduled to be dining out 4 times over the next 5 nights. But Richard isn't someone you wanna say 'no' to, especially when he's kind enough to extend an invitation like this. So I happily said 'yes', and scrambled for the next 2 hours to borrow the right camera equipment from someone, since I foolishly left both of my SLRs at home. Thankfully I do have a few friends with SLRs lying around, and one even got her driver to deliver it to my office. I've always been a fan of molecular gastronomy. Yes, the guys who brought you foam, sous vide, spherification and all that fun stuff. Guys like Ferran Adrià of elBulli, and his countless disciplines. Well, Chef Eneko Atxa likes to play with lab equipment, too. In addition to the syringes, circulators, steamers and dehydrators that everyone else has, he's also been known to use ultrasound to infuse and concentrate flavors, not to mention putting together a system to capture the smell of fresh herbs being cut. Mad scientist? Maybe. I arrived at Amber Bar at the appointed time, and immediately ran into a few good friends. We were all to be seated at the same table, and had among us blogueurs, been-there-done-that ex-bloggers, wannabe blogueurs, hell-no-I-am-no-bloggers, professional chefs, home chefs... and a couple of VVIP stragglers who found themselves sitting at what Da Jam once called "the cool table". This was gonna be fun. Grosset Brut Excellence - not a bad way to start the evening... Nice and a little toasty. Truffled egg - I'd seen Richard post pictures of this earlier in the day, and I finally got to see it for myself during the cooking demonstration. Raw egg yolks are placed on serving spoons. The sac is pierced with a syringe, and half of the yolk is extracted. Hot truffle broth is then injected into the sac, which has the effect of cooking the yolk remaining inside. Very fun. Very yummy. Truffled martini - this was meant to go with the truffled egg, although I didn't get the pairing right... Made with 1½ shots of Belvedere, lime juice, apple juice, egg white, rosemary and basil. Then add a dash of truffle oil and sprinkle with pepper. This was OK I guess, although I didn't really understand why the pepper was only on one side. 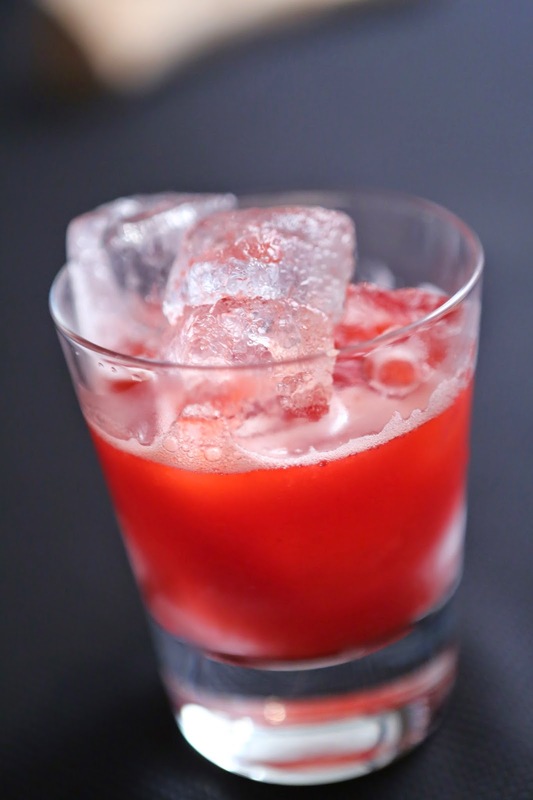 Bloody "mar" - a reinterpreted Bloody Mary with sea urchin juice, which made it nice and creamy. 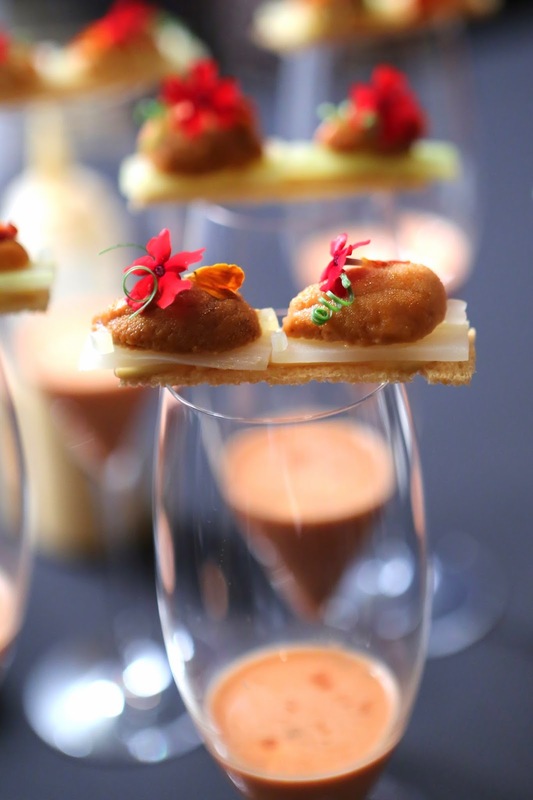 Topped with a cracker with sea urchin mayo and sea urchin tongues. Oyster with pearl - this is where the ultrasound comes in... It's used to help bottle the smell of the Andaman Sea, and the sea water is poured over dry ice to release that smell. The Fine de Claire oyster came with Andaman Sea gel, silver cloud fungus and diced salicornia. Very nice. Foie gras ashes - foie gras mousse on croûtons, topped with shavings of ashen foie. Nice and smoky. The garden - ahhhh... the edible soil. Made from dehydrated beetroot and almond. And featuring your garden variety vegetables like zucchini, carrot, peas, cauliflower, broccoli and tomatoes. But let's not forget the tomato emulsion inside, which brought some acidity to the dish. 2011 Laurenz V Grüner Veltliner 'Singing' - toasty, a little flinty, lemon citrus, a little ripe on the nose. A little bitter on the finish, perhaps a little overripe. Baby squid, croquettes and armagnac - in addition to the squid, there was a squid ink croqueta, tempura squid, as well as deep-fried leek. The squid consommé was enhanced with a dash of Armagnac. 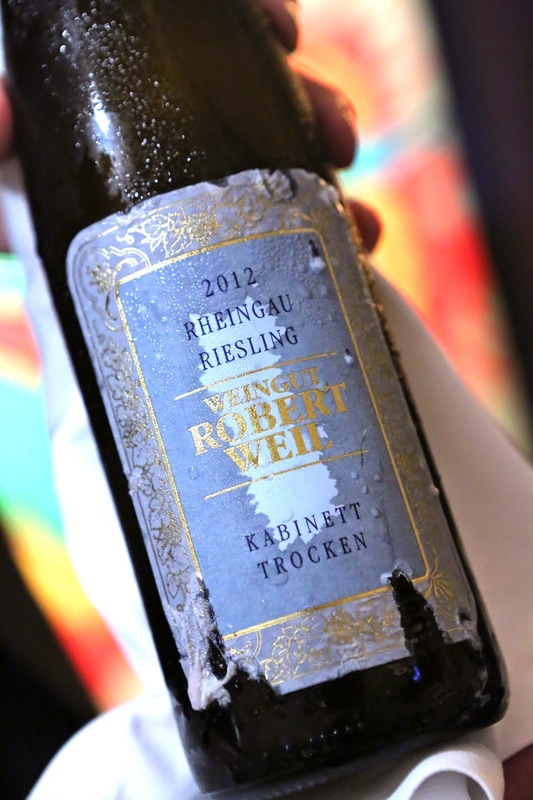 2012 Robert Weil Riesling Kabinett Trocken - very floral, with lots of white flowers and some white pepper. Very dry on the palate. Sea bass, txangurro and cauliflower - YUM! The sea bass was extremely tender and succulent. Very, very nice. But it was the txangurro that stole the show... all that really yummy crab meat! I wish there was more of it. And all that cauliflower in various forms - including as filling to the dumpling... really made me very happy. 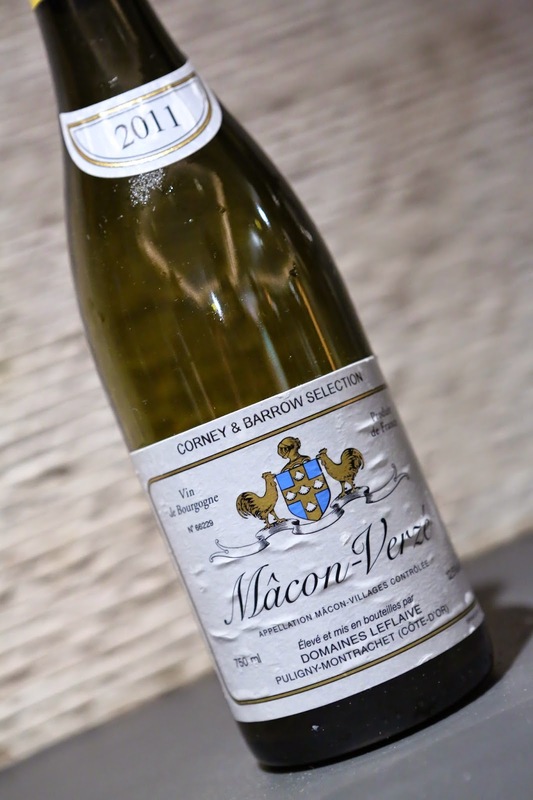 2011 Domaine Leflaive Mâcon-Verzé - a little ripe, with lemon citrus notes. Reasonable acidity balance. Pigeon with hazelnuts - I loooooove pigeon, and this was probably the best pigeon I've had since that mind-blowing dinner at Ma Cuisine. The "hazelnuts" were actually made from foie gras and chocolate, and definitely very tasty. The pigeon itself sat on a bed of duxelles, which was itself very yummy. The pigeon was so, so, so, so well executed! Looooove the pink and tender flesh. This is one of those times when I wish I was at some Cantonese pigeon restaurant, order up 3 of these birds and just grab 'em with my hands and chomp. 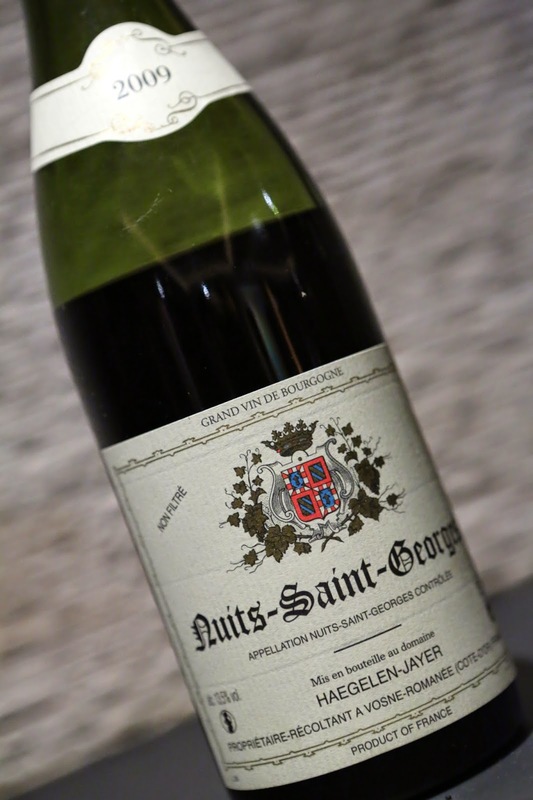 2009 Haegelen-Jayer Nuits-Saint-Georges - still very tannic as it's a young wine from a big vintage. A little ripe and jammy, with forest pine, potpourri and some metallic and mineral notes. Croissant - now this looked interesting... A blob of cream cheese flavored with rosemary, thyme and mint, sandwiched between two pieces of raspberry meringue. Taking a peek inside revealed a puff of smoke, coming from the bed of ground chestnut powder, made from burnt chestnuts. The smoky aromas were so alluring... I ended up using my fingers to scoop up the powder and just ate it, licking it off my fingertips. Oh, of course I ate the "chestnuts", too... which were made from chilled chestnut cream with chocolate. Strawberries and roses - rose-flavored marshmallow with strawberries, strawberry foam. Slurp. Oh we were also presented with a few vases of roses, from which rose aromas emanated to tease our sense of smell. Louis Perdrier Brut Rosé - prominent nose of strawberries, although I found the nose also a tiny bit pungent. Certainly paired well with the dessert! The macaron seemed to have a raspberry/chocolate ganache. Pretty good. This was a really wonderful, wonderful evening... totally unexpected but highly appreciated. Not only did I sit at the "cool table", but I think we were also the most fun (read: loud). The conversation strayed in countless directions, at times colorful... and we joked that after tonight, none of us - including the VVIPs - would be able to come back to Amber or the Mandarin ever again. Lucky no one from Linklaters was at the other tables! Another free meal at Amber?